In this guest post, artist and session leader Berry Matthews shares her plans and reasons for organizing Watershed 2017 Residency Session I: Earth, Water, and Fire. Several spots are still available for those interested in joining the group from June 4-16. Additional participants include guest artist Trisha Coates and AIA members Rosette Gault, Elizabeth Garber, Roy Pearson, and Joan Watson. Learn more and register. I have been to Watershed four times. The first time was soon after I had lost my teaching job, my dad and my boyfriend. I was pretty depressed, but Watershed gave me a wonderful place to work hard and move forward. I still remember working at night on an installation with a large fan on high to keep the mosquitoes from devouring me. (I am so glad the studio is now screened in!) Many years later when I came back with a group organized by Paula Winokur, there were new quarters for artists and a bathroom building with a fabulous tile wall. We were there during Salad Days and I remember helping out in the kitchen peeling carrots for the huge crowd, and making a fire installation. 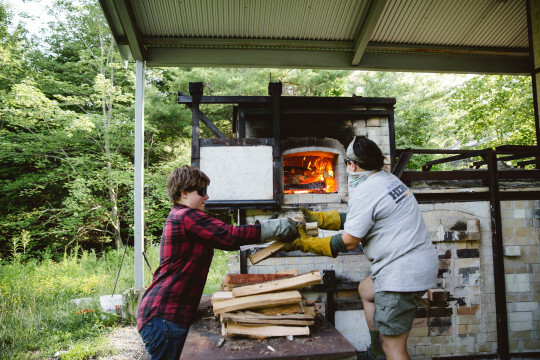 I came back soon after that and again for a fall salt kiln firing, each time enjoying the wonderful fresh meals, and a great sense of support and friendship. I love the earthiness of Watershed! Each time it feels a little more like home. Each time I come I have learned new ideas to use from other artists’ approaches to clay (who knew a heat gun could be so useful?) 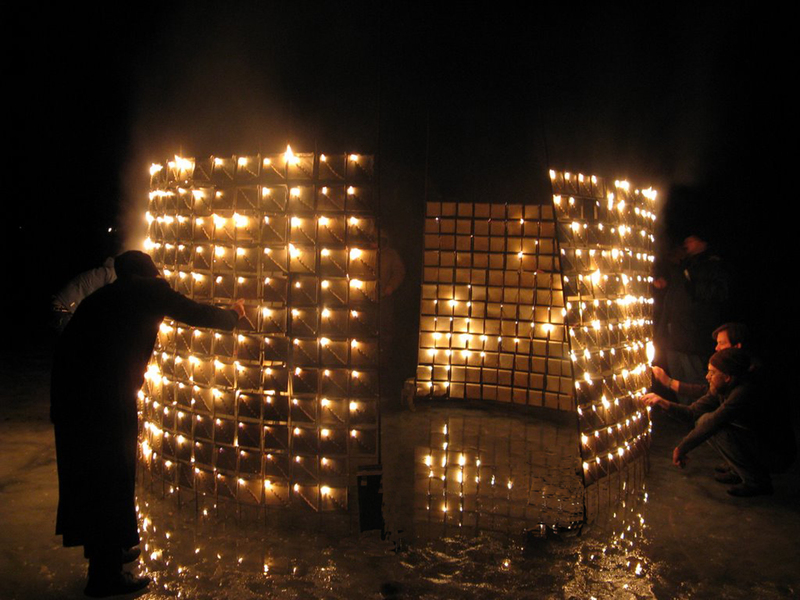 During Session I, there will be artists at Watershed who make large installations with paper clay and artists who are primarily potters, but who use their functional work to extend conversations about art and how we approach it. I look forward to meeting new people with new ideas and to seeing how our session uses the time at Watershed expand and grow our work. And to making new friends! To learn more and sign up for Earth, Wind, and Fire – visit our 2017 Summer Residency page. There is room for any artist to join this session. Artist Whitney Forsyth shares her plans and reasons for organizing a residency session at Watershed. Spots are still available for those interested in joining the group from July 23 to August 4, 2017. Additional participating artists include Kate Dameron, Cathryn Thomas, Allison Lackner, Nancy Andrasko, Shawn Phillips, Beth Edwards, and Mike Teal. Learn more and register. My first visit to Watershed was in 2008 when I was invited to attend an AIA session led by Virginia Scotchie. It was a meaningful time full of laughter, relationships, food, hospitality and tons of clay. The studio was inviting and productive. Hearing and smelling the rain through the open screen windows in the studio was refreshing and calm. 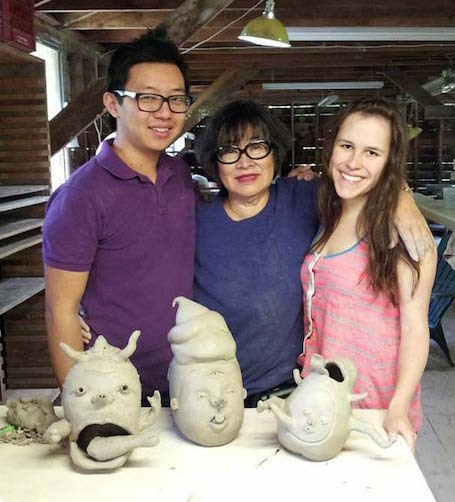 It was a time for me to refocus my studio practice with a wonderful new family of clay artists. I have always wanted to return to Watershed for another residency, but the timing had not been right. 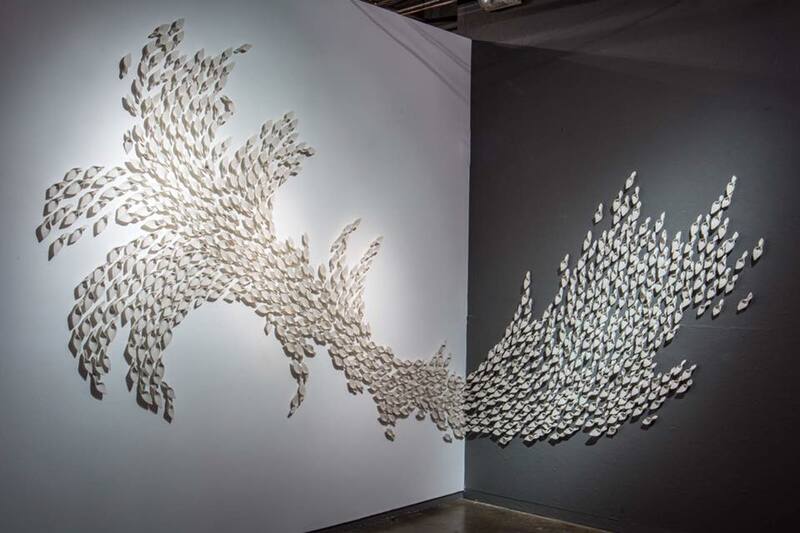 Last year I connected with Watershed board member Gretchen Keyworth, who travelled to Tulsa, Oklahoma with a group of Smithsonian Renwick Collectors to see what was happening in contemporary craft in our city. When we met she made the Watershed connection with me knowing I had been to a residency there, which led me to finally propose an AIA session. I gathered a group of Tulsa based clay artists that I know through teaching at The University of Tulsa and interacting within the larger Tulsa art community to join me at Watershed this summer. 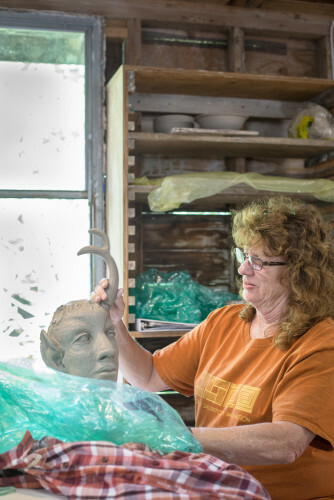 We are a diverse group of clay artists from sculptors to potters who care about clay in our lives and our community. We have witnessed a recent transformation in the Tulsa art community through the revitalization of our downtown and arts district. 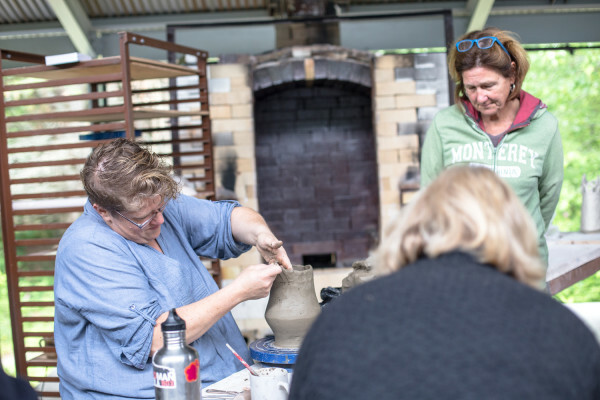 As clay artists we are actively looking for ways to make a difference in this thriving art community, through teaching, making and exhibiting our own work, and participating in dialogue that might lead to new community clay opportunities. My hope is that artists who live in other communities that are on the verge of or have experienced this same kind of revitalization will join with us to share their ideas and efforts. 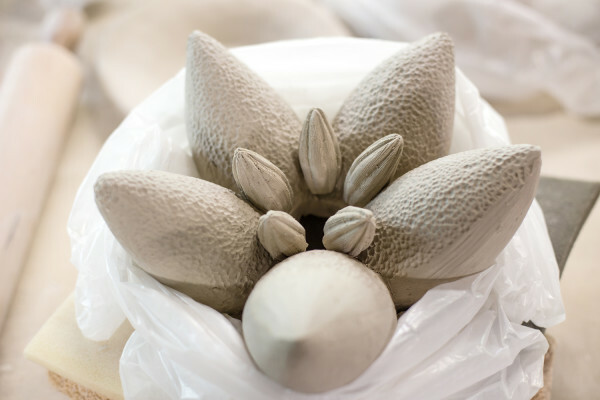 We are excited to see more clay in Tulsa in the future, in education, museums, galleries, art centers and public spaces and to find creative ways to make this happen. 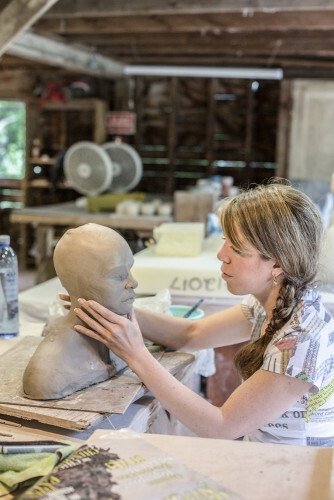 We are passionate about our studio work, each other, our art community and would love to spend time with other clay artists who share the same enthusiasm and experiences from different places in the US. 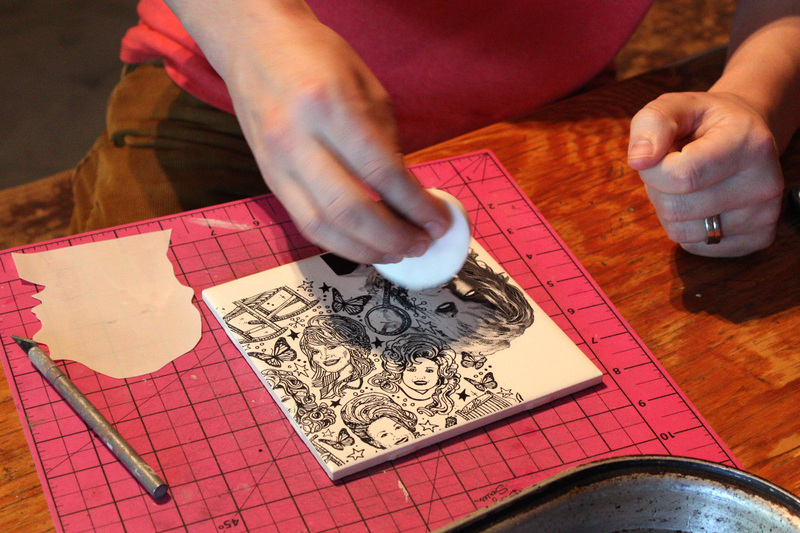 Click here to learn more about joining this session of artists at Watershed. 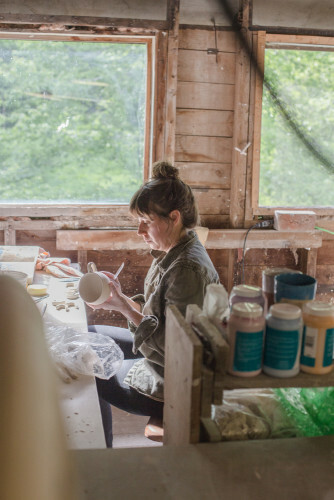 Maine has a long tradition of influential artists and craftspeople finding space in our state to create and contemplate close to nature. Some stay for a few weeks, others make their homes here for a lifetime. The most recent issue of The Maine Quarterly shines a spotlight on some of Maine’s most influential artists, arts organizations, collectives, and communities, examining their role in our state’s creative life and history. We are thrilled to be included among those featured! 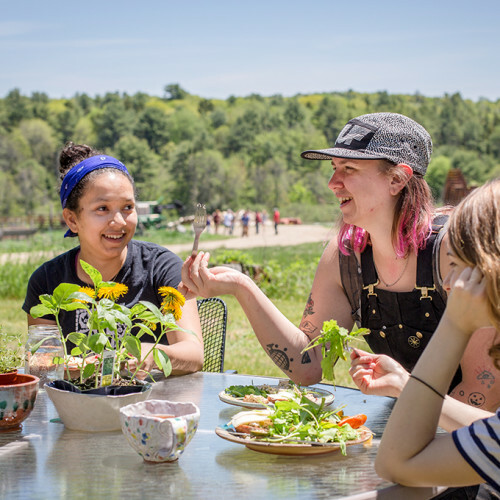 Read the piece on Watershed in the Community section of the publication – be sure to watch the short video on Watershed’s residency program and a second video to learn more about Salad Days . (Save the date and plan to join us for this year’s Salad Days on July 8!). You can also peruse the whole issue here. On October 14, The American Craft Council will induct Watershed Co-Founder Chris Gustin into the ACC College of Fellows for his outstanding achievements in the craft field. We are thrilled to celebrate with Chris as he receives this honor! 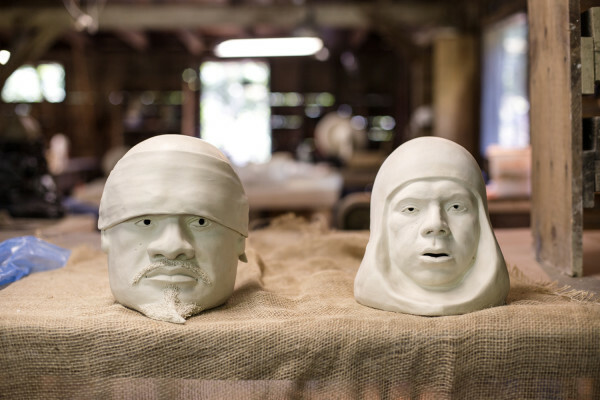 His extensive body of ceramic work, as well as his commitment to forming creative spaces (like Watershed) where artists can engage, connect and informally learn from one another, highlight his unique vision and lasting impact on the clay community. 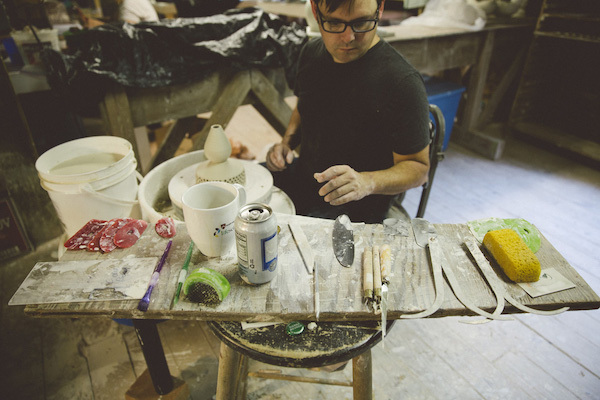 Chris grew up with clay in his blood, as his family co-owned several whiteware ceramic manufacturing companies in Los Angeles, CA. 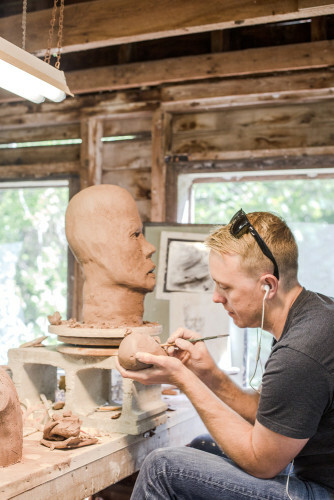 His love of clay developed early but it took his brother’s urging for Chris to pursue the artist’s path. He briefly worked for the family company as a factory foreman, but changed direction to attend college at Kansas City Art Institute and graduate school at Alfred University in the early 1970’s. 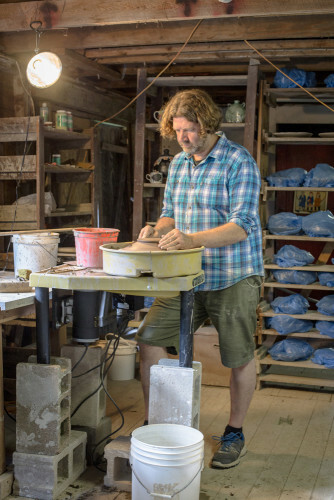 After completing his formal studies, Chris taught ceramics at a number of northeastern colleges and received several fellowships that helped establish his career in clay. 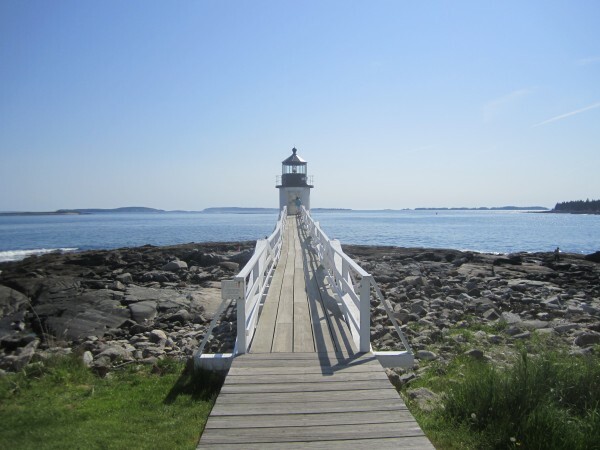 He exhibited work extensively, both nationally and internationally, and eventually settled in South Dartmouth, Mass, where he still lives today. 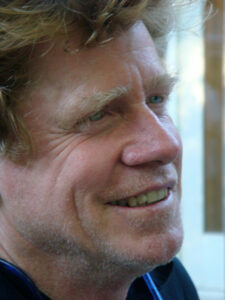 From 1989-1999 Chris served as Associate Professor of Ceramics at the University of Massachusetts, Dartmouth. He retired from teaching in 1999 to pursue his own studio practice and run his custom tile production company full time. 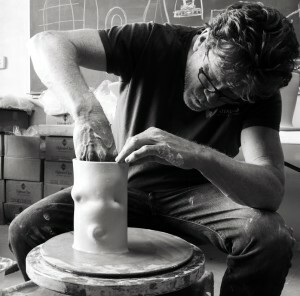 Chris’ profile in this month’s issue of American Craft magazine focuses on the pivotal impact that several personal and professional relationships have had on his life and career. He speaks about the profundity of his brother’s encouragement to follow his interest and passion for clay and the pride he has for the role Watershed has played in so many artists lives. In the following video, hear Chris share the story of Watershed’s beginnings and enjoy scenes from our early days. 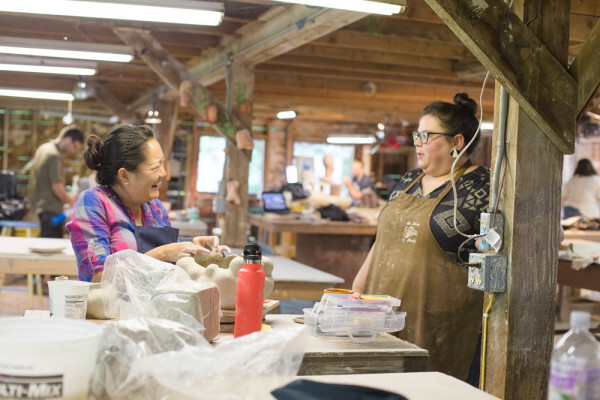 While our center continues to grow and develop, the core of what we offer—the opportunity for artists to live and work alongside one another and form lasting creative communities—remains true to Watershed’s origins. 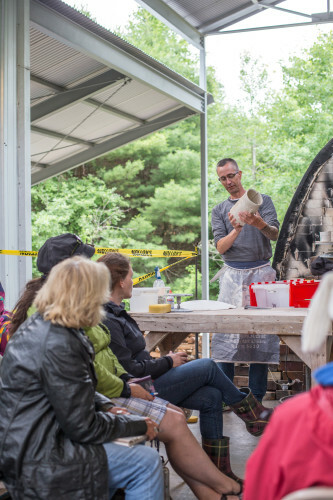 Chris, we are grateful for your vision, passion, and dedication to not only your work and Watershed, but to the ceramics community as a whole. Congratulations on this well deserved award! A week and a half ago, Watershed was brimming with the energy and excitement of Jason Burnett’s surface design workshop. 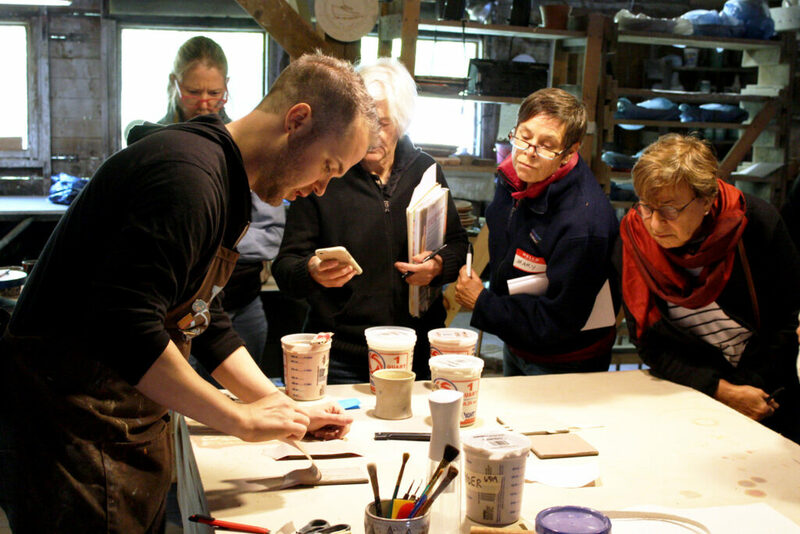 Fourteen artists arrived from many corners of Maine, as well as many corners of the country, to join Jason as he shared a wide range of techniques and tricks for ceramic surface design. 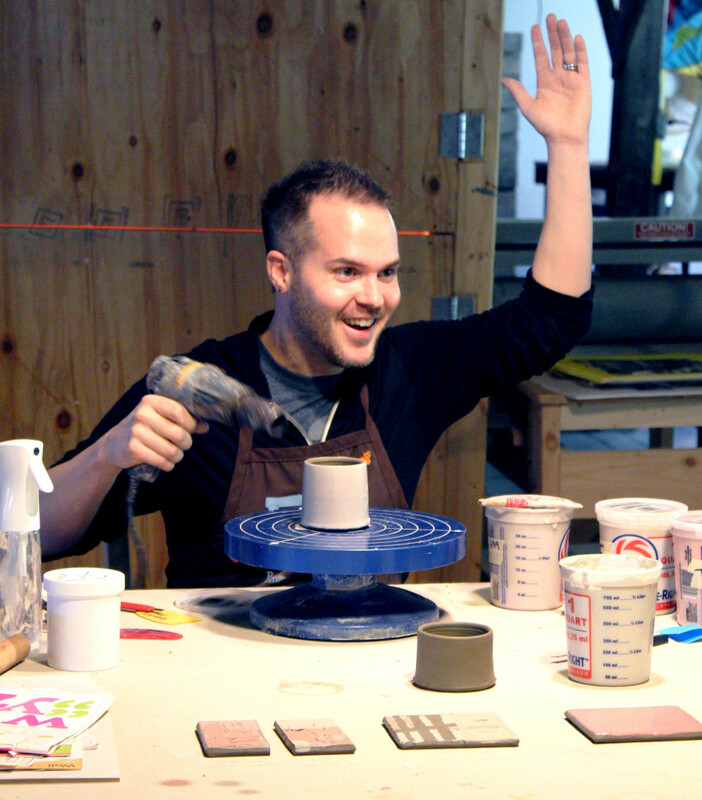 During the three-day workshop, Jason filled the factory with his southern warmth and charm, and kept the group laughing as they learned everything from making and applying decals to inlaying with slips, burning screens to applying screen printed images with under glaze inks, repeat pattern design to simple Photoshop techniques, and much more. The group walked away from the warm fall weekend at Watershed excited to try many of these methods in their own practice. Jason’s work has been shown and published extensively, in a number of publications including Pottery Making Illustrated, Ceramics Monthly and American Craft. 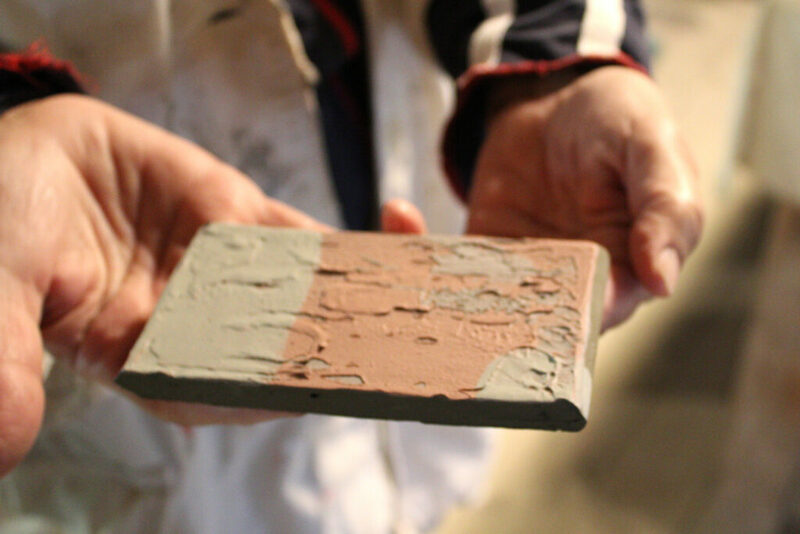 In 2015 he wrote and published a book: Graphic Clay: Ceramic Surfaces & Printed Image Transfer Techniques. 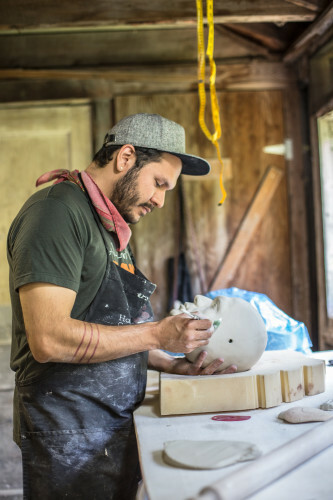 He is known for his functional ceramic pieces which layer slips, stamps, screen printed images, decals and lusters to create bright and fantastical objects that tell stories through their surfaces. Jason’s enthusiastic teaching style kept everyone engaged and excited throughout the weekend. 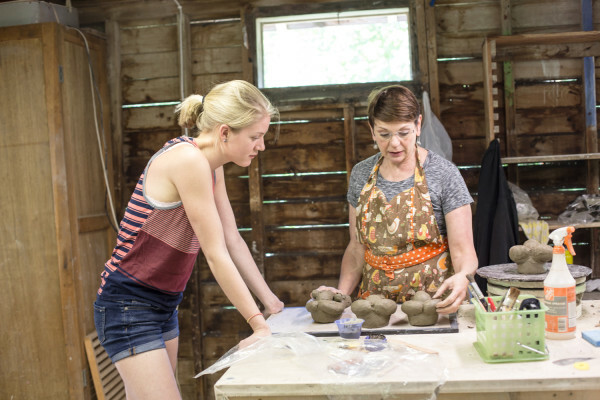 In mid-July, Watershed hosted a one-week residency session for K-12 art educators. 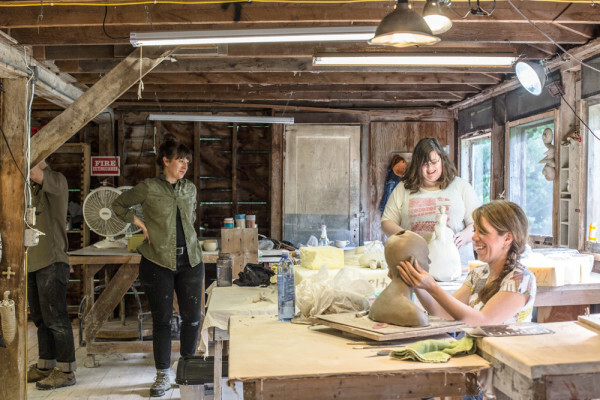 This pilot project provided a rare opportunity for teachers from Maine and beyond to connect, learn new skills and strategies, and work on their own art. Over the course of the week, we (Liz Proffetty and Malley Weber, Watershed’s teaching artists) led morning mini-workshops on a range of topics relevant to classroom art teaching. Participants then spent the afternoons working on independent studio projects. 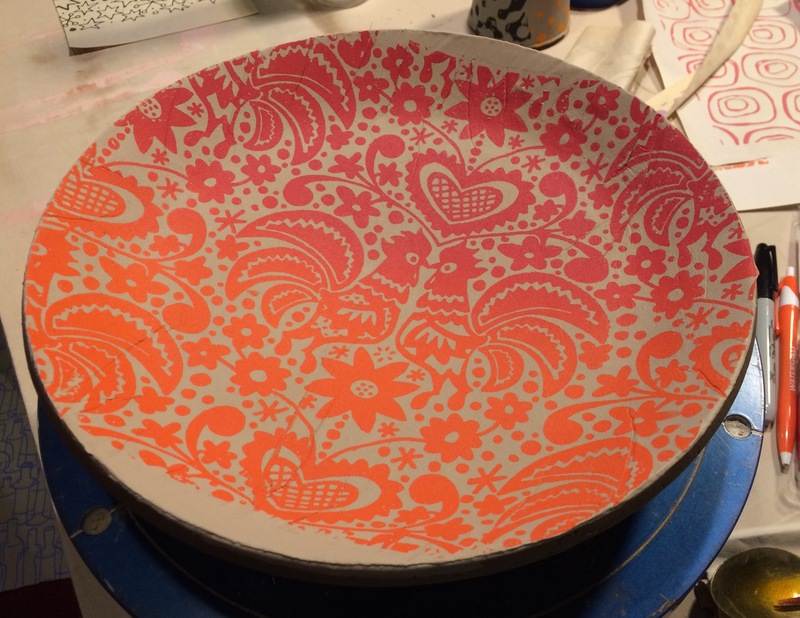 During the first day of the session, Liz shared surface decoration techniques including sprigs, sgraffito, terra sigilatta, silk-screen, mono-printing from newsprint and digital decal transfer techniques with the group. Amaco kindly donated teacher’s palette glazes and underglazes for the participants to use throughout the week. On Tuesday morning, Liz wowed the educators with techniques and tricks to create thrown and altered forms that could be taught to middle and high school students. 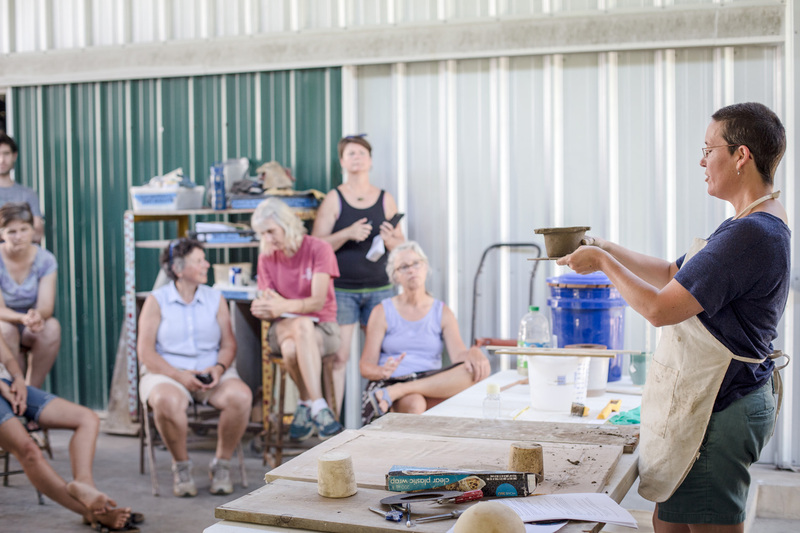 In the afternoon, some participants collaborated on a raku firing, others made a break for the local swimming hole, and a third group joined Watershed summer staff member Megan Stevens for an impromptu glaze mixing lesson. 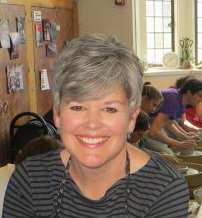 During the Wednesday morning session, Malley shared information about Potters for Peace, a nonprofit group of ceramists whose work addresses the impact of the global water shortage. By partnering with factories around the world, the Potters help make effective ceramic filters for those without access to potable water. Inspired by their efforts, Malley used a multidisciplinary STEAM (Science, Technology, Engineering, Art and Math) approach to develop a lesson on creating ceramic filters from Maine clay. She demonstrated how to create a filter for the group and received helpful feedback from the teachers on how they might adapt the lesson to use with their own students. Later in the week, Studio Manger Reeder Fahnestock discussed how to repair electric kiln elements and thermocouples. He explained how to tackle basic repairs and helped the group better understand the inner workings of electric kilns. Each day after lunch, teachers shared lesson plans and/or ideas with one another. Some seemed reluctant to share at first, but they received enthusiastic support and encouragement from their colleagues. 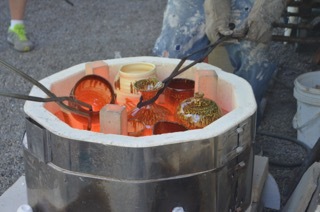 The group’s final day in session was filled with excitement as participants unloaded their final glaze kilns. Many tests, experiments and creations were “oohed” and “ahhed” over, and last minute notes were taken before the artists parted ways. 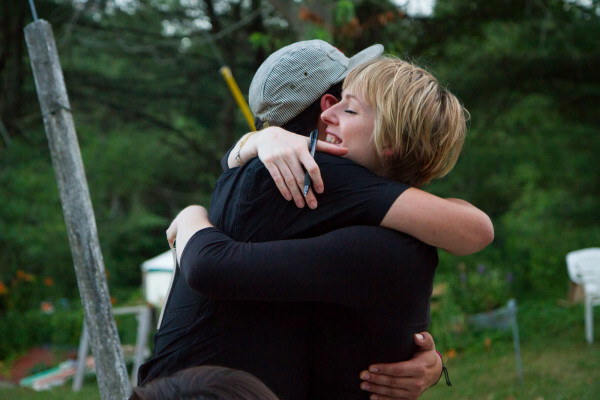 Perhaps the most valuable part of the residency was the community that formed so quickly. It was clear that participants developed friendships and contacts that will benefit them personally and professionally for years to come. We are grateful to The Belvedere Traditional Handcrafts Fund of the Maine Community Foundation, who provided support for the session. We also extend a special thanks to the art educators who put so much of themselves into teaching the next generation of artists. It was a pleasure to work with all of you! Why Watershed’s Fall Residency is for You! 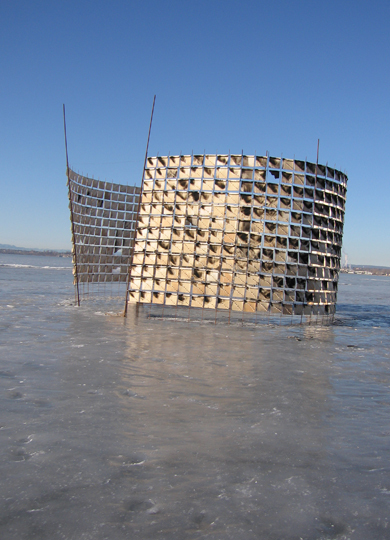 Some artists come to Watershed to work on a specific project that would be challenging to complete when surrounded by the distractions of daily life. 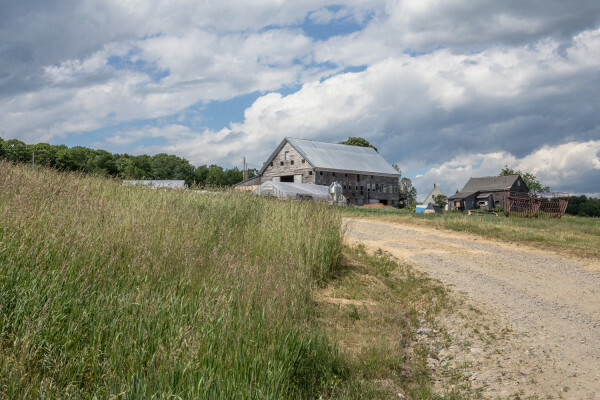 The residency provides ideal conditions to focus on your work while receiving support from a small community of artists. Having six weeks of solid work time proves invaluable for those interested in creating a cohesive body of work. Plus, whether you’re applying to juried exhibitions, graduate school, other residencies or post-bac programs, or simply furthering your practice, you’ll have artists at all stages of their careers working alongside you to help generate ideas and provide feedback. After completing formal schooling, artists and craftspeople have few opportunities to work in group settings. 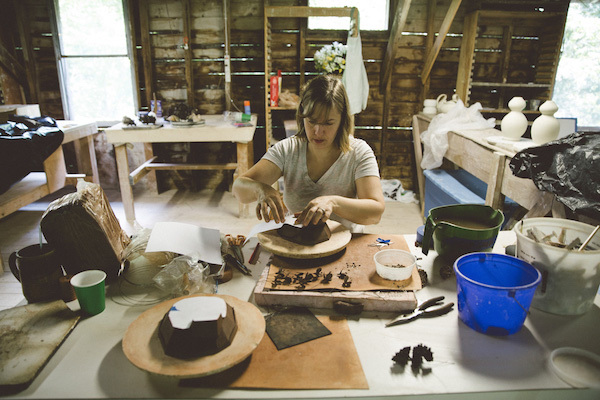 The Fall Residency gives you the chance to form an engaged community with other makers. Throughout the session, a number of additional artists come to Watershed to participate in workshops and group firings. Many fall residents develop professional and personal friendships during their time at Watershed that last for life. Maybe you have an idea that you’ve wanted to explore or you want to recommit to your creative work, but life keeps getting in the way. There are errands to run, chores to do, and social or family obligations that keep you out of the studio. The Fall Residency offers the chance to get away and find the necessary time and space to devote to making work without distraction. It’s the most beautiful time of year in Maine! 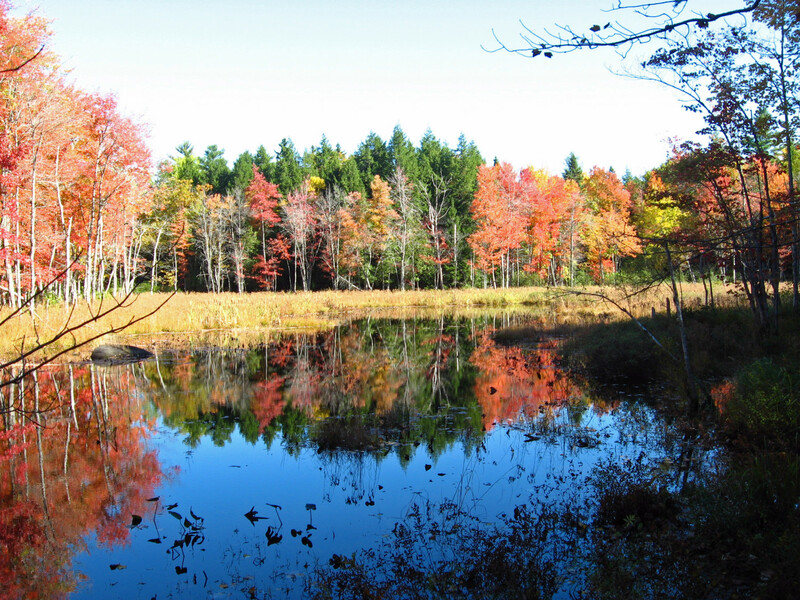 Don’t tell the tourists, but September and October are (arguably) Maine’s most splendid months. The crowds are gone and you can explore the beaches, lakes, mountains, and coastline without fighting traffic or crowds. Numerous fall festivals and celebrations provide a great opportunity to get to know the area, including many events within the arts and crafts community. Are you ready to sign up? Applications are being accepted on a rolling basis. The residency runs from September 6 to October 14. Click here to learn more and apply! We can’t believe how fast the summer is going! So many talented and dynamic artists have brought energy and life into the studios during the first three summer sessions. 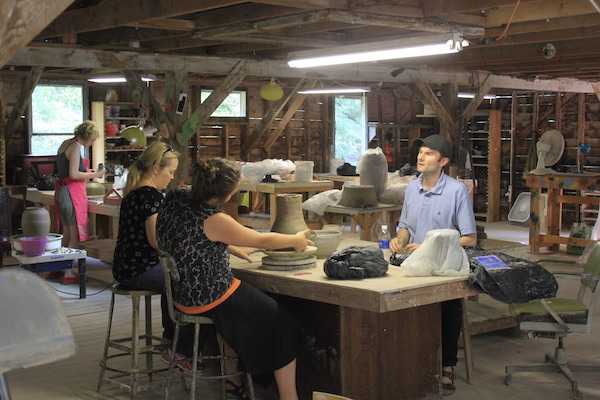 Currently, we have a group of K-12 ceramics teachers here for a one week session and the studio is buzzing with activity and ideas. We wanted to share a few studio shots (with a couple of scenic vistas for good measure) as we look forward to the final two sessions of the summer. 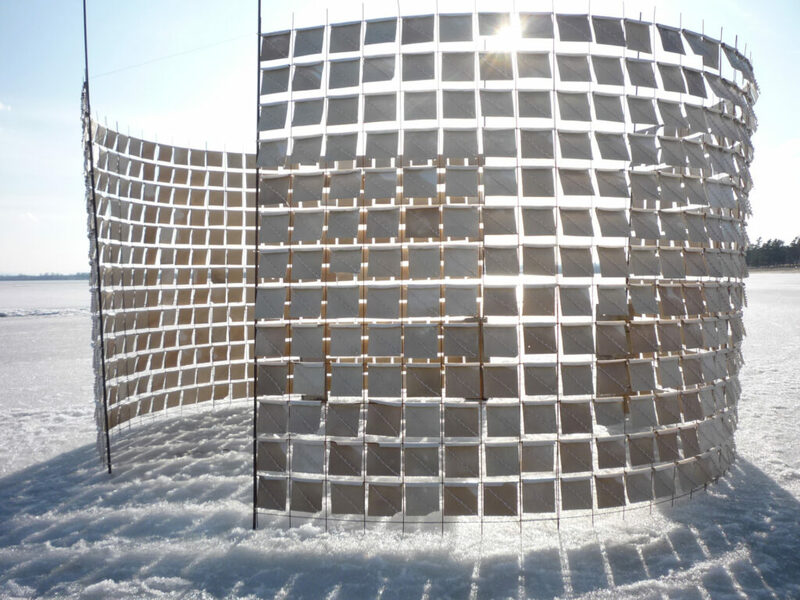 As an AIA Leader, you invite 4-8 artists to participate in the residency with you. 6-10 other artists join the session, drawn by a shared interest in the theme. Some groups like to plan wood firings, cup swaps and group trips. Others like open-ended time with no plan – it’s up to you! Members of your AIA group get 15% off their residency fees. Everyone likes a bargain! 100,000 tourists from Massachusetts and New Jersey can’t be wrong! 1. AS THE AIA LEADER, YOU COME TO WATERSHED FOR FREE! Watershed is accepting applications to organize a 2017 residency until June 15, 2016. 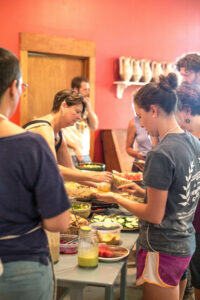 Liz Hafey spent last summer at Watershed, making over 500 plates for this year’s Salad Days. 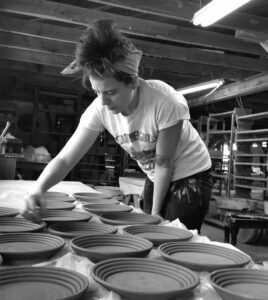 Liz completed her BFA at Massachusetts College of Art in 2013 and earned a post baccalaureate certificate from UMass Darmouth in 2014. 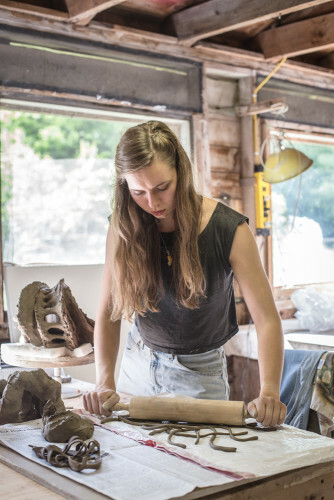 She spent the following year participating in residencies at Truro Center for the Arts in Massachusetts and The Cub Creek Foundation in Virginia. 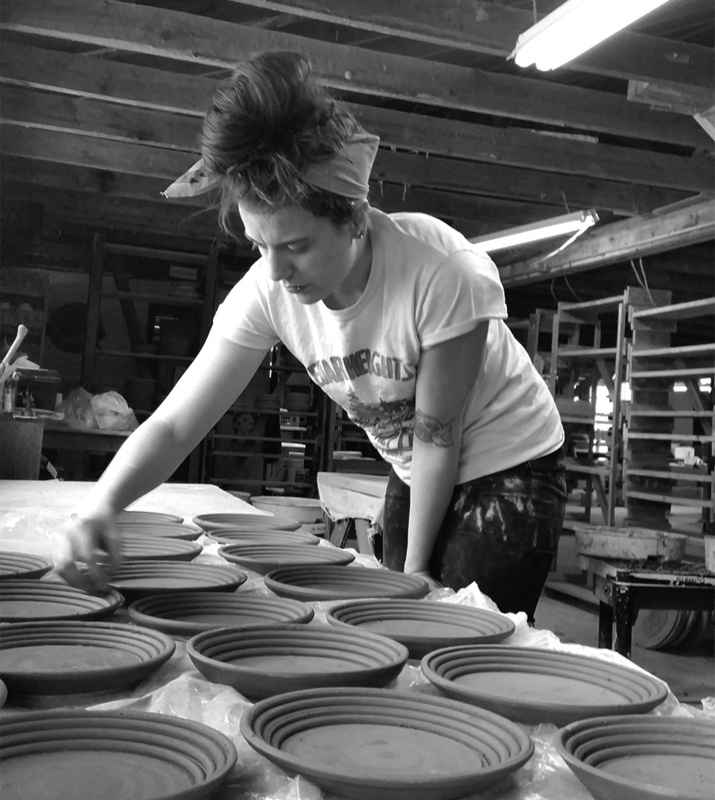 She also apprenticed with Andrew Appleby, a master potter in Orkney, Scotland. 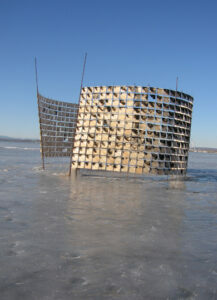 The relationship between the natural world and the built environment is central to Liz’s work. 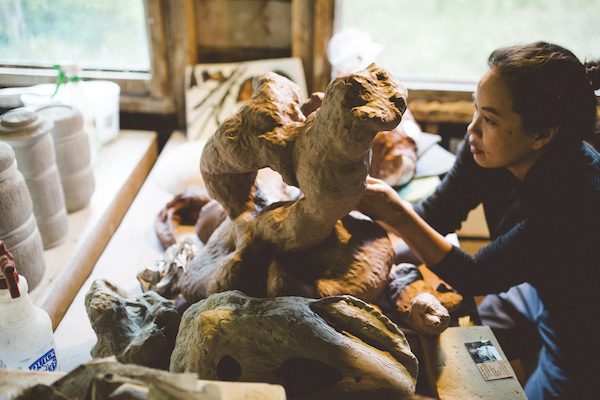 Through her studio practice, she strives to reinterpret the impact of nature’s influence on human-made structures and objects. 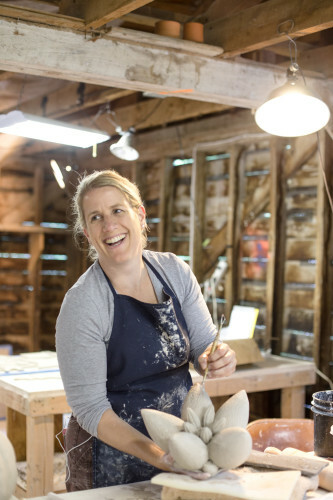 During her time at Watershed, Liz was able to continue exploring the Atlantic coastline and found inspiration for her plates in the colors and forms of discarded lobster pots and vintage boat hulls scattered along the shore. 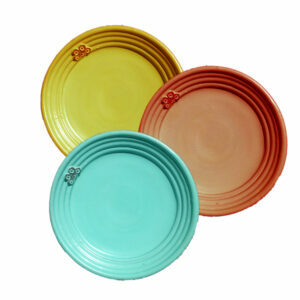 At first glance, Liz’s plates evoke the bright color palette of 1950’s mass-produced kitchen wares and vehicles. 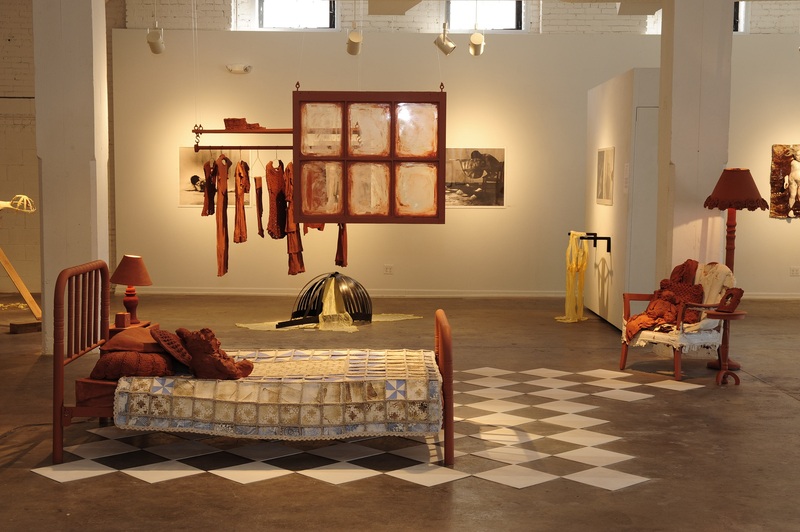 However, the fiesta-ware feel of the surfaces is interrupted by Liz’s decorative details that expose Watershed’s terracotta earthenware clay, highlighting the handmade nature of the work and referencing the rusty brown of antique rivets and bolts. Meet Liz and take home one of her colorful plates on Salad Days, Saturday, July 9 and visit her website to learn more about her work.